Determining whether or not material in your home is dry. Once a water intrusion occurs in a home, the next step usually revolves around figuring out how to dry the material that has been affected. A small overflow from a sink left on can be handled with a towel or mop potentially, but a pipe break in a wall or a toilet backup are much harder to handle. Specifically, regarding water intrusions that involve leaking through walls, ceilings, and floors, the drying process becomes a little more involved that just mopping up what you can see. 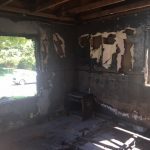 The definition of mitigate is “to make less severe or alleviate” and that is exactly what you are doing when taking the steps necessary to dry out your home. 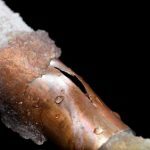 Not identifying the source of the leak or leaving potential standing water in, around, or underneath material can lead to many issues further on down the road. The main problem a homeowner now has once deciding to mitigate properly is how do I determine what is wet and how do I go about drying it? This is where we here at Built come in. To paint a picture, let’s imagine a situation where a pipe bursts behind an upstairs bathroom sink. This spills a significant amount of water into the bathroom itself, creeps into the adjoining bedroom, and leaks through to the kitchen ceiling below. As one can imagine there is a lot of material involved in these three areas of the home. Using our moisture detection equipment and thermal imaging camera, we here at Built can get a very detailed idea of where the water has travelled, how saturated the material is, and develop a drying strategy from there. In this case, we would need to gain access to the wall behind the cabinetry to fix the pipe and “flood cut” surrounding drywall to properly dry the saturated framing inside the wall. Next, we would remove any materials that are completely compromised once saturated. These types of material usually include vinyl flooring, carpet pad, and any insulation. Finally, we would cut a small portion of the ceiling out downstairs to properly dry the sub-floor underneath the bathroom. This comprehensive strategy would result in a thorough mitigation of any further damage to all effected material in the home and ultimately ensure everything is dry. In summation, drying out a home thoroughly cannot be done with just towels and a mop always. Often times, many other areas are effected besides the obvious ones where you can clearly see the water. If you find yourself in that situation, we here at Built can help you by coming to your home, using our moisture detection tools, and developing a thorough drying strategy for you. Even if you suspect that the intrusion is not that serious, it may be in your best interest to have us come check it out for you to be sure and we here at Built are happy to do so.